The North of the 45th Parallel exhibition began in 2008 as a way to showcase the diversity of artistic talent in the upper Midwest region. Since then hundreds of artists from Michigan, Minnesota and Wisconsin have exhibited artwork in a range of media from painting to performance. Each year, a different juror is involved in the painstaking process of reviewing submissions to create a cohesive exhibition that represents both rural and urban artists from a wide range of backgrounds, training and approaches to creative practice. 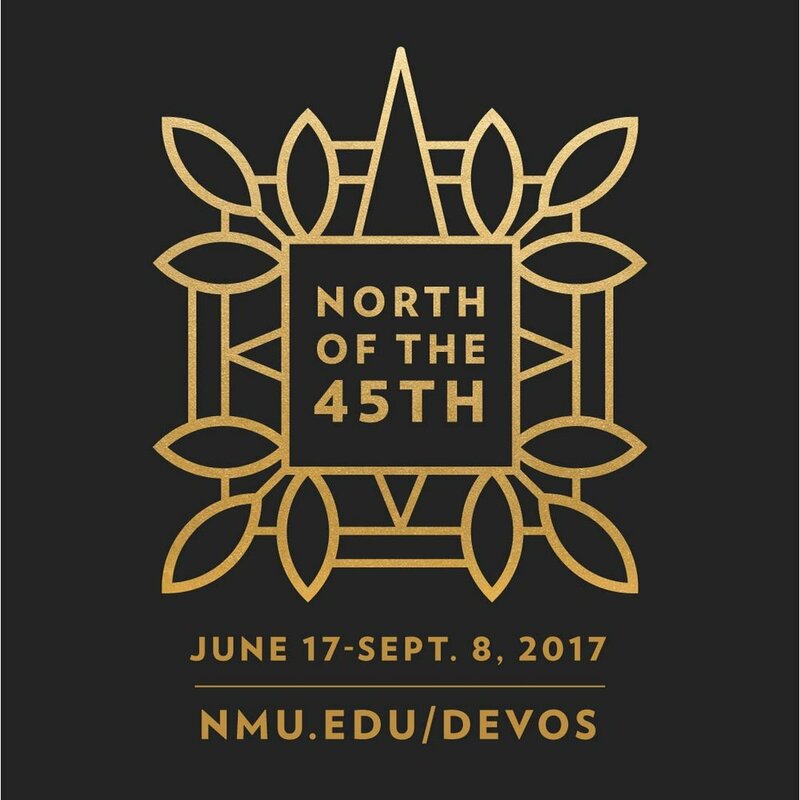 For 2017, the museum is presenting a non-juried exhibition to celebrate the tenth anniversary of North of the 45th Parallel. This idea was inspired by State of the Art/Art of the State at the Cameron Art Museum in Wilmington, North Carolina, which referenced Walter Hopps’ 1978 Museum of Temporary Art in Washington, D.C.Both Hopps and the Cameron Art Museum hoped to find innovative ways to give more artists more access to curators and exhibition opportunities. The North of the 45th Parallel exhibition is aligned with this spirit of access, and each year the entry pool and artists selected have represented a wide range of backgrounds and involvement with the "art world”. The exhibition has featured both full-time working artists with MFA degrees and self-taught artists who have never shown their work publicly, side-by-side, in one gallery space. Each year, under the guidance of the juror, the exhibitions have been completely different but equally fascinating to present. Art can inspire, build community, and be a platform for resistance or reflection. As we move forward and reflect on the last nine years of the exhibition, we recognize how the world has changed politically, socially, economically, and culturally. This 10th anniversary exhibition will celebrate the artists of the region while also asking questions about what the role of the artist is today. To borrow from the Cameron Art Museum’s title, what is the State of the Art? How do artists function in our current systems (economic, political, social, artistic)? Artists are encouraged to consider these questions and present ideas, questions, and solutions, and through this process create a robust dialogue. At noon on June 16, 2017, the museum will open for 24 hours to accept entries from artists within the defined geographical region for this non-juried exhibition (see Eligibility Guidelines below). Any artist living north of the 45th parallel in Michigan, Minnesota and Wisconsin, age 18 and older, are invited to bring one piece of artwork to the museum for the exhibition. All artwork must be no larger than 9 feet square or 27 cubic feet. The museum will accept artwork until time runs out at noon on June 17, or room runs out in the gallery. An opening reception will be held on June 17th from 7-9pm. During artwork drop-off and the exhibition reception, three guest curators will be present to meet and greet artists: Christopher Atkins (Curator of Exhibitions and Public Programs, Minnesota Museum of American Art), Adriana Greci Green (Curator of Indigenous Arts of the Americas, The Fralin Museum of Art at the University of Virginia) and Steven Bridges (Assistant Curator, Eli and Edythe Broad Art Museum at Michigan State University). Three cash prizes will be awarded to artists: Guest Curator’s Choice, $500 (selected before the reception); Audience Choice, $500 (voted upon by museum visitors until close of the exhibition); Acquisition Award, $500 (selected by museum staff and voted on by the museum’s collections committee). This exhibition is made possible by our generous sponsors: RG Design, River Valley Bank, and Travel Marquette. North of the 45th Parallel: 10th Anniversary Edition. DeVos Museum of Art. June 7 - September 18, 2017.